The information contained on the Healing Touch Physical Therapy & Rehabilitation website is protected by copyright. All information contained on, or accessible through, this website is provided to you on an “as is” basis. 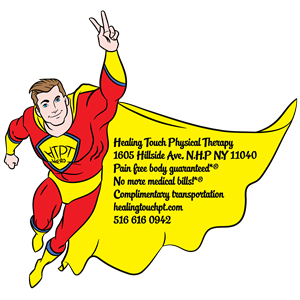 Healing Touch website does not warrant that it is accurate, complete, current, or reliable. To the fullest extent permitted by law, Healing Touch website disclaims all warranties, either express or implied, statutory or otherwise. Always seek the advice of your physician or other qualified health provider with any questions you may have regarding a medical condition. Thank you for choosing us, we understand very well that you have many choices. We don’t even consider you as a patient but as a client who is under our care and protection therefore we will do everything we can to make you pain free. We specifically ask you to do is be complaint with all the home exercises your therapist gives. Your appointment time is specifically yours so don’t be late, avoid last minute cancellations and there is no excuse for no shows as your time spot could have been used by someone in pain instead of going into waste. If you had informed us earlier we could have given the time slot another person that is in pain. We have specific policy regarding the above which is: For the first time you are excused. For the second time you have to pay $40 for the scheduled time period, further appointments are only made after payment has been received. Third time, even if you are willing to pay we won’t be seeing you anymore. To us such persons don’t have any concern for others who are in pain therefore we will not be dealing with such people. If you fall into mechanical and mechano-chemical category, we will give you 5 visits FREE including any copays you have after the 10 visit. If you fall into chemical category, we won’t be treating you and will be sent to your primary care for further testing. We will only send bills that is not paid once as it is required by law. If your insurance company don’t pay your bills, we will fight it but won’t send you the bills. You are only responsible for medical bills if your insurance was terminated since starting of treatment or if the insurance send you the treatment reimbursement directly. We ship within one business day on most orders. We offer same day free in-store pickup. Please add a note to seller in the shopping cart and we will email you when your order is ready for pickup. 14 day return policy. Merchandise must be in the original packaging. Please call our customer service before returning a product. Returning any item without authorization will not be refundable. Restocking fees up to 20% may apply in some conditions.